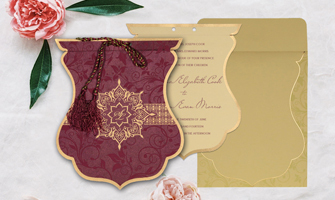 Seal the wedding invitations with a wax seal and cast a classic retro look to your wedding. If you are a Potter head, then this is certainly a go-to thing for you. Wax seals not only look classier but are also assumed to be very expensive and extravagant. (Good news, in reality they are not that expensive) Caution, be very careful and witty while using the wax, too much wax might look untidy and sloppy. Foil tape is a perfect alternative for foil-stamping. A thin roll of foil tape will add the much-needed jazz and glamour to your foil stamped wedding invitation cards. What’s next? Dress up your card with an elegant belly band and amuse your guests with your preparation. 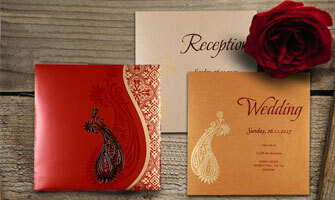 After all, wedding card is the very first impression that has to be great! Emboss your name or monogram on the wedding invitation suit and engrave a subtle touch of luxury to your big day. 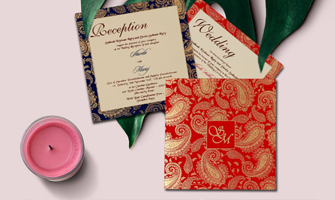 Personalized embossing has been a part of wedding invitation cards since long, broadcast your creativity by embossing a corner that has never been embossed before. Also, you can go creative in selecting/ making the type of monogram for your wedding. 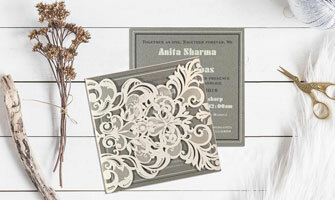 Give your guests a reason to adore your wedding invitation card with crafty edges and punch. Hallmark a great sense of aesthetics with a look that is beyond any comparison. Cute little shapes of heart or strawberries can be your pick depending on what you two decide. If your guest list isn’t that long, you can go for DIY options too. It will be fun! How about getting a personalized wedding stamp designed exclusively for your wedding? Lend your wedding cards a feel rich factor and leave your guests spellbound with your exquisite taste of wedding invitation cards. Here is a free tip, don’t keep the stamp size too big because the greater the area it covers, the messier it will look. 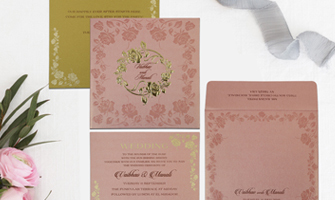 Create a big impact with envelope liners that align well with your wedding theme. Envelope liners definitely bring a big smile on anyone’s face. Want to know what’s in? Follow the latest trend and add splashes of water color to your wedding card crafted with love and classic creativity. We hope the tips and tricks for a fabulous wedding card dress-up will give a ritzy look-feel to your wedding. And please do remember, you can always think of trying DIYs wherever possible. DIYs not only feel light to the pocket but also lend a personalized touch to your wedding cards. Keep reading, keep exploring and all the best for your wedding.